Academy sixth-formers tell it like it is . 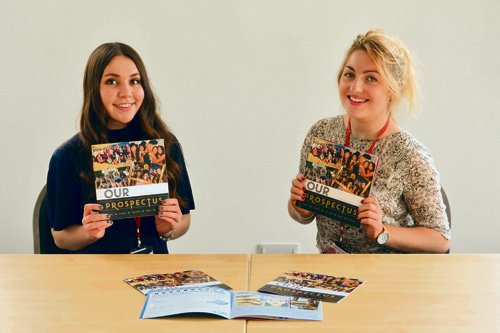 . .
SIXTH Form students from Winterbourne International Academy have produced their own alternative prospectus giving the lowdown on post-16 life at the academy. Their publication includes revision tips, advice on budgeting, and how to prepare for your first day in sixth form as well as all-important information about the common room, cafe, trips, parties, proms and other events. Five students from Years 12 and 13 worked on the propsectus with support from Rob Phillips, head of communications at The Ridings Federation of Academies, and Allan Finnie, studio manager at Pace Print in Clevedon. The students, Rachel Hickey, Chloe Yuen, Holly Sawyer, Tily Brogan and Elliana Saladino, who have recently been busy with AS and A-level examinations, are considering further education or employment opportunities in journalism, PR, media and marketing.